Daft: "Silly or stupid", informal, mainly United Kingdom. Cambridge Dictionary. 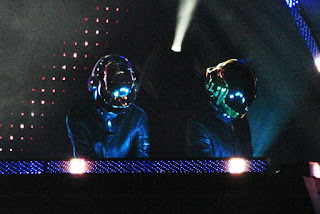 In a world where we fight to each other to share content of our lives on social media posing with the best of our looks, when ordinary citizens got madly crazy to become reality television stars we have two musicians from Paris whose face is unknown since they began recording, this was when their adopted their current name Daft Punk. They started working in Great Britain and one musical pundit from London said "this is only daft punk", the review was negative, yet Daft Punk deemed it as positive thereby their name Daft Punk. 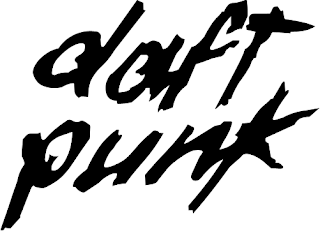 Notwithstanding that statement, Daft Punk is regarded nowadays as true artistic quality. We are to remember some relevant Daft Punk tunes inside Daft Punk history mentioning another one Harder, better, faster, stronger that is so good that in addition to the skills of Kanye West produced the song Stronger, one of the best recorded in last times. Get Lucky, the most popular song from their last album in which they spend 4 years working on it, they did win 5 Grammy Awards, the only one electronic band in music history to win 5 accolades in a single night (overall they have won 7 Grammy awards being nominated another 6 times). Their first disco was Homework that made them renowned on independent circles, this videoclip with a dog as main protagonist is really good. Daft Punk scarcely render live concerts. However, when they do it they blow everything apart. For instance, one of the best concerts ever was made in Coachella, Southern California in 2006, their performance is still considered as one of the greatest ever. Daft Punk is formed by two Parisian people named Guy-Manuel de Homem-Christo and Thomas Bangalter. As their image, look and everything they arrange, we do not know yet what they are to do next. However, given the quality of everything they produce we have to be alert. Is somebody out there who still believes Daft Punk produce stupid punk music? Perhaps!!!!! Do share and comment.